Since pets can't talk to us, they often are unable to communicate problems before they become a major concern and threat to the pet's well-being. Any hint of abnormalities may bring recommendations for additional laboratory testing to confirm suspicions. Your pet's weight is one of the first things we'll check when you come in to our office, be it for an exam, a vaccine, or even a nail trim. Significant weight gain or loss can be an early warning of disease, so we believe it's extremely important to check your pet's weight at every visit. Obesity is the most common nutritional problem in pets. Your pet's overall body condition will be evaluated and appropriate recommendations of diet and other nutritional needs will be made. Temperature, pulse, and respiration are all assessed. Elevation in any of these can be a sign of infection, inflammation, illness or pain. The doctor will also listen to your pet's heart for any murmurs, gallops, or arrhythmias, and the lungs for crackling, wheezing, or signs of congestion. Ocular disorders such as severe conjunctivitis, cataracts, and glaucoma can sometimes be prevented if detected early enough. Thorough examination of the ear canals can prevent painful ear infections and loss of hearing. The ear canal of pets is anatomically different from humans with the majority of the canal hidden from view with the naked eye. Tumors, grass seeds, excessive wax, and ear mites are commonly found in the lower part of the ear canals. Dull, dry, brittle hair, cessation of grooming (in cats), and hair loss can all indicate an underlying illness. Flea infestations can lead to serious diseases such as anemia. The doctor will observe your pet's coat for any of these changes. 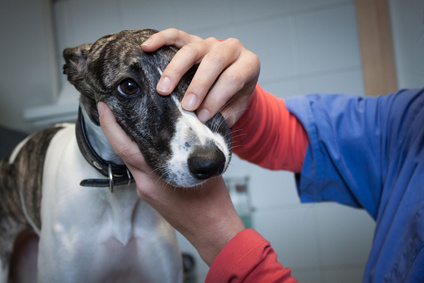 She will also fully palpate your pet from nose to tail to check for any abnormalities in the skin, muscles, or joints. Tumors, skin tags, warts, joint problems such as swelling or pain, and your pet's strength and gait will all be noted and recommendations will be made accordingly. Taking care of your pet's mouth is one of the most often overlooked, but extremely important, parts of their overall care. Regular dental care can help add up to 5 quality years onto your pet's life, not to mention making those kisses a lot sweeter! The doctor will examine your pet's teeth, gums, palate, and tongue to evaluate dental and oral health. She will observe the amount of tarter on the teeth, grade the progression of periodontal disease, as well as look for any abnormalities such as oral tumors or resorptive lesions. For more information on oral care, please visit our dental page here.